Desert varnish is a dark coating on rocks found in arid regions. The coating is composed dominantly of fine-grained clay minerals. Within the clays are black manganese oxide and red iron oxide. 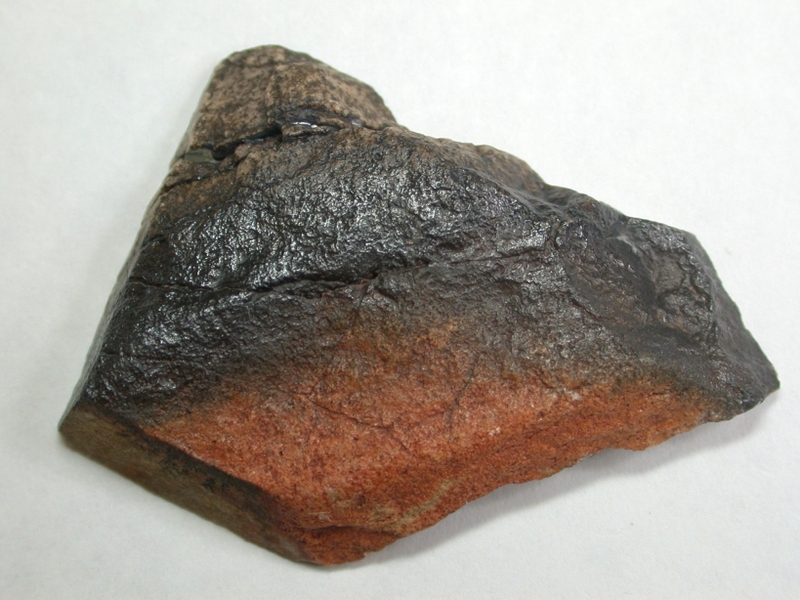 A more general term is rock varnish which applies to dark coatings on rocks in general. Varnish can be a prominent feature in many landscapes. It often coats canyon walls, particularly in the areas where water flows down the the sides of canyons such as this canyon wall near the Whitehouse at Canyon De Chelly National Park, Arizona, USA, coated with varnish. Desert varnish plays an important role in archeology. Many petroglyphs are created by chipping through a dark coat of desert varnish to expose a lighter colored underlying rock. This petroglyph is in Indian Petroglyph Petroglyph National Monument, New Mexico, USA. Desert varnish is commonly seen coating rocks in deserts. On the east side of Death Valley, you can observe canyons with rock slides of different ages distinguished by the degree of varnish development. The older slides have a more mature coating of varnish. Well-developed coatings can form in the splash zone of rivers in arid regions. The example of a manganese oxide coating in the splash zone of the Rio Grande River, New Mexico, USA, contains clays and manganese oxide similar to that found in desert varnish. 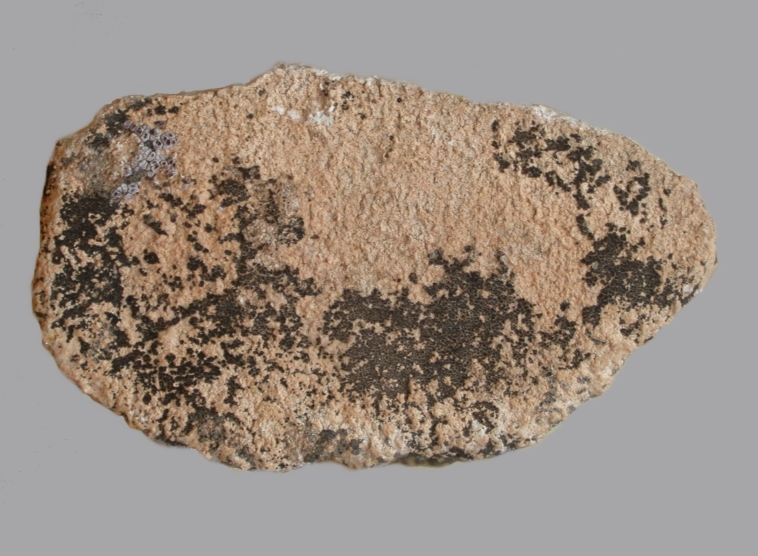 This is a side view of a 5.1 cm wide piece of rhyolite coated with desert varnish from Stoddard Wells, in the Mojave Desert, Southern California. The portion of the rock that sits above the level of the desert pavement is partially coated by a black layer a few 10's of micrometers thick of desert varnish. At the contact with the desert surface, a shiny, dark ground-line band develops containing a thick layer of varnish which essentially completely coats the region of the rock in contact with the top layer of the soil. Below the ground line band in the region where the rock is buried below the surface, an orange coating develops. The interior of the rock is completely different from the varnish coating. Desert varnish is dominantly clay. The clay minerals represent the clays found locally in the region where the varnish develops. In the clay layer, black manganese oxide (the mineral birnesite) and red iron oxide (the mineral hematite) add color. A cross section through desert varnish shows the contact on the lower right with the colorless quartz and feldspar grains and black iron oxides of the rock with the deep red varnish layer. Layering in the clays can be seen to follow the contour of the underlying rock. The clays appear to be derived from airborne dust. Varnish has a sharp contact with the underlying rock. In this SEM image layers of clay are seen lying on the underlying rock. 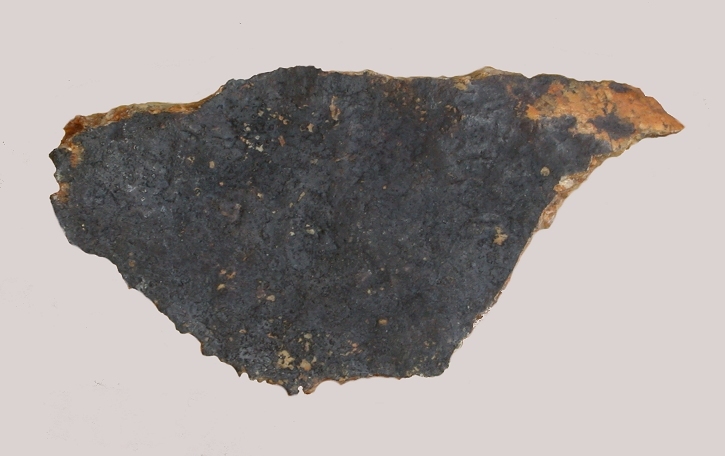 The sample was prepared by fracturing a thin slab of a varnish-coated rock. The exposed surface filling most of the frame is a fracture through the varnish layer. 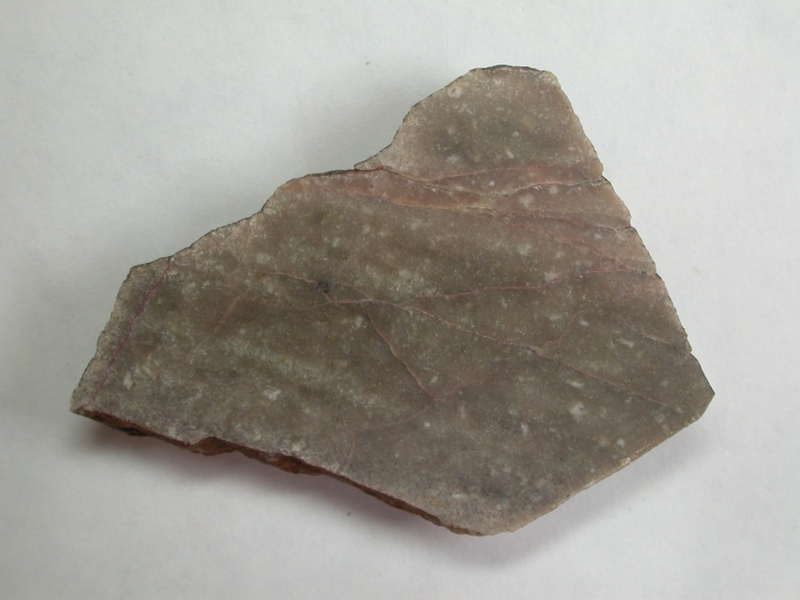 A portion of the underlying rock surface can be seen in the lower left portion of the image. Note how the varnish smoothly goes around the rounded mineral grain in the bottom center-right side of the image. Counterfeit manganese deposits can take various forms. This is an algal stream deposit from Rock Creek, California. It looks like a coating of manganese oxide, but contains no manganese at all. This is a fungal dendritic growth from sandstone from Meteor Crater, Arizona which also looks like a manganese deposit to the casual observer. Dorn RI, Bamforth DB, Cahill TA, Dohrenwend JC, Turrin BD, Donahue DJ, Jull AJT, Long A, Macko ME, et al. (1986) Cation-ratio and accelerator radiocarbon dating of rock varnish on Mojave artifacts and landforms. Science 231:830-833. Dorn RI, Oberlander TM (1982) Rock varnish. Progress in Physical Geography 6:317-366. Dorn RI, Oberlander TM (1981) Microbial origin of desert varnish. Science 213:1245-1247. Garvie LAJ, Burt DM, Buseck PR (2008) Nanometer-scale complexity, growth, and diagenesis in desert varnish. Geology 36(3), 215-218. Liu T, Broecker W (2000) How fast does rock varnish grow: Geology.28:183-186. Perry RS, Lynne BY, Sephton MA, Kolb VM, Perry CC, Staley JT (2006) Baking black opal in the desert sun: the importance of silica in desert varnish.Geology 34: 537-540. Potter RM, Rossman GR (1977) Desert varnish: the importance of clay minerals. Science 196:1446-1448. Thiagarajan N. Lee C (2004) Trace element evidence for the origin of desert varnish by direct aqueous atmospheric deposition. Earth and Planetary ScienceLetters.224:,131-141. Picture credits to R.M. Potter.